The fourth annual Montecito Motor Classic (MMC) hits Coast Village Road on Sunday, September 27, and this year’s show is gearing up to feature more than 150 cars, and dozens of motorcycles, as well. In the run-up to the show, I got a chance to talk to one Ms. Alma-Rose Middleton, a board member and participant in the show, who will be dis- playing her automotive pride and joy, Ms. Gina, in the show in a few weeks. Middleton has been with the MMC since the beginning and has watched as the spectacle has grown in awareness and stature. “I’m excited about the fact that it’s getting so well-known, and the Petersen is participating in it,” she says, adding that there’s been a lot more interest in the show from not only within the Santa Barbara and Montecito communities, but from out- side as well. Middleton also provides the design for the event’s website. Ms. Gina is getting revved-up for her role in the festivities, too. This is the name that Middleton gave to her 1955 Ford Thunderbird when she bought it ...ahem, her... eight years ago. “I loved that body style since I was just about 10 years old... It took my breath away, and I could never shake that car out of my system,” she says. Before she met her husband, Orwin Middleton, she knew “more so than most men do about vintage cars,” particularly because of her store in L.A. that dealt in vintage car memorabilia. In fact, she had begun pursuing her love of cars after an injury cut short her 10-year polo career, which she sees as a “turning point” in her life. But she credits Orwin with putting her ultimate automotive fantasy on the road to reality through the use of eBay. They found Ms. Gina in Ventura, and Middleton immediately knew they were soul mates; the car was born in June 1955, exactly one week after Middleton’s birth. In fact, they even have joint birthday celebrations, complete with cake traditions. The car is in great shape, with all the systems in good working order. Its 292-cubic-inch V8 engine puts out 200 hp, which makes for a strong comparison against the original six-cylinder-only Corvette it was battling against. In fact, the 1955 T-bird was a direct response to Chevy’s sports car. Ford’s approach, however, which it called “personal luxury,” ate the Vette’s lunch that year, outselling it 23 to one. Of the more than 16,000 T-birds sold in the ’55 model year, very few had the transmission setup that Ms. Gina has, according to Middleton. Only 10 percent of the cars had the manual gearbox, and of those, only a few hundred added her car’s overdrive to the 3-speed floor shifter, she says. 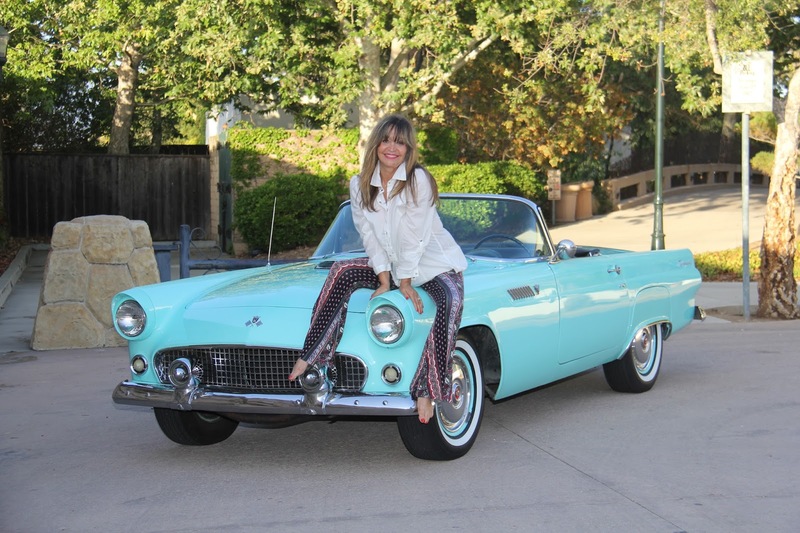 She also feels like the car reflects her personality, being “sporty and young at heart,” and perhaps she gets to enjoy some of the glamour of its association with the many celebrities who owned one in its heyday. And Middleton loves the attention and connections that her lovely steed draws, with everyone from young kids to old ladies complimenting her on Ms. Gina, particularly the Thunderbird Blue color. Ms. Gina has seen her fair share of glamour, being regaled with various awards at car shows over the years, and she lives a pampered life, under the protection of both a garage and a car cover; you can never be too careful! Theirs is very much a car-loving home, with Orwin caring for some incredible cars, including the 1961 Corvette he’s had since he was 19 years old. And for nearly 40 years, he’s had a Ferrari 250GT Lusso, whose average value has skyrocketed in the past four years to roughly $2 million. But the car he may show at the MMC, she says, is his 1957 Corvette racecar, which is a regular participant at historic races like the recent ones in Monterey. He also happens to be the designated mechanic for Ms. Gina, and he knows the car in and out, she says, but Alma-Rose herself has the skills to work on the car as well. In fact, she even keeps a few tricks up her sleeve for quick fixes on the road. Well, maybe not up her sleeve. Middleton always keeps a pair of pantyhose in the car, which trace back to an experience she had when she was 22. She was driving an old Audi when it had alternator issues. When she got the car off the highway to open the hood, she saw that the alternator belt was “hanging by a shred,” and would need replacing. Because she was wearing pantyhose, she was able to rip off one of the legs and tie it around the alternator to generate just enough charge to get her to a gas station. Hearing that story cemented her “car girl” status in her husband’s mind, Middleton says. You can see Ms. Gina and 150 other beautiful classics at the Montecito Motor Classic on Coast Village Road, Sunday, September 27, 8 am – 3 pm. The event benefits the Santa Barbara Police Activities League (PAL) and the Santa Barbara Police Foundation.